In my trading, I use mostly Fibonacci combined with Pivot lines (daily and weekly pivots). Still, there are times when I check yearly Pivot lines. You may find examples below very interesting. They are calculated on price, many traders and fund managers follow them. Same with algos and trading robots, which are very well aware where important Pivot lines are. Day traders use daily Pivot Points (calculated on previous day price), swing traders use higher pivots like weekly or monthly. So we take high, low and close from the previous year, sum it and divide by 3. That is our Pivot line (middle line). There are also S and R lines (more about calculating pivots here). That is why these levels are very important because they are calculated based on such a long period. If we check examples we can see that price respects them. Of course, not in every case. We have to remember that there are many other important levels like trend lines, support and resistance lines from previous lows and highs and so on. Still, in many cases, it is worth to know where are yearly Pivot lines. SP500 is moving down very strong. Some people say that this is a correction, other that it is start of the bear market. We will see. For now, we can see that yearly pivot line at 2536 area stopped a selloff twice. It was a place where many traders were taking profits from short positions. On monthly chart, different story. We can see clearly that yearly R1 was a strong resistance and pivot line was a support. 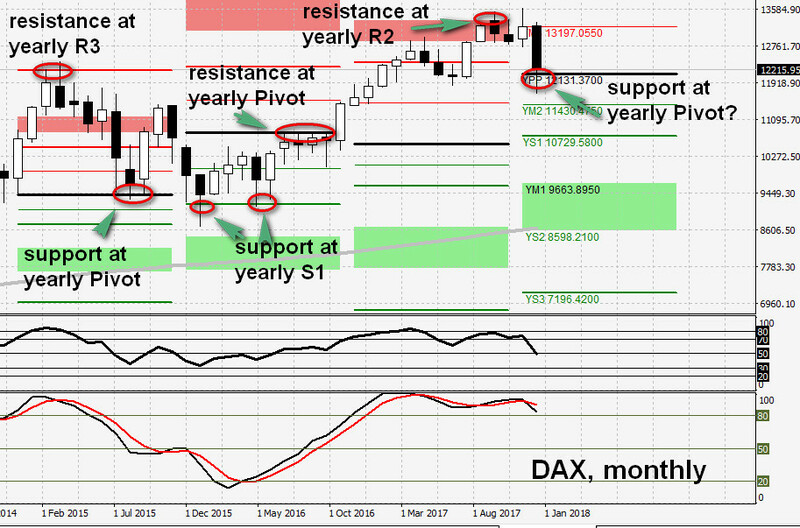 Of course, we have to remember about one thing – pivot worked as a support, but it does not mean that move down is over. For now, it worked as a support. If we see a move below yearly Pivot that it can be a sign that continuation of a move down (and even a bear market) is possible. Below monthly chart of WTI oil. 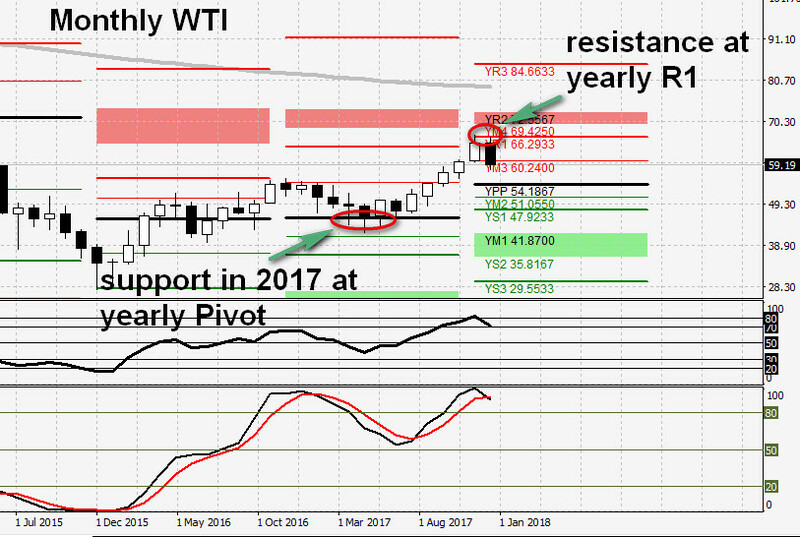 In 2017 there was a strong support at yearly Pivot line. For few months we saw a range move around 50$. Later, after break price went up to the yearly R1 level which was a resistance. The very interesting situation on monthly USDJPY. 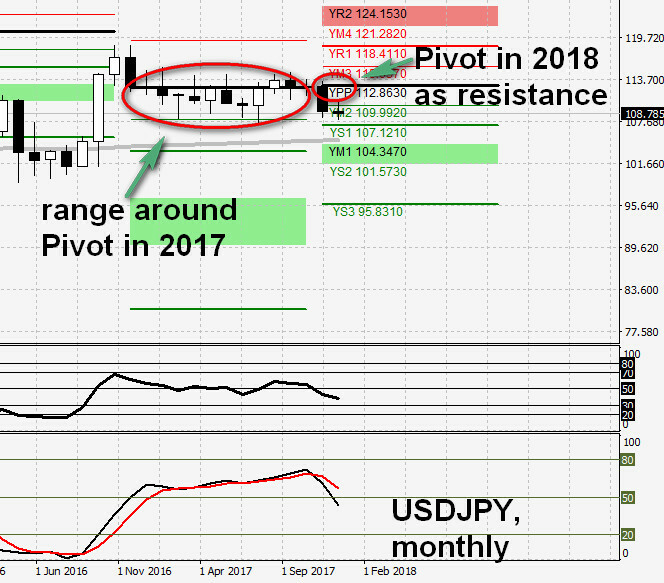 The whole 2017 was a range move around Pivot line. Now it looks like Pivot for 2018 is working as a resistance. What is next for this pair? We will see, but I watch it closely. Simple example. 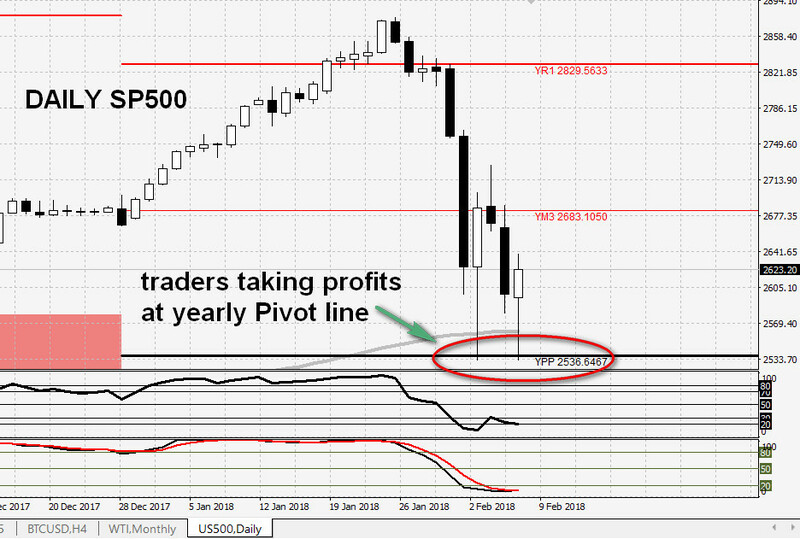 In 2016 and 2017 Pivot lines worked as a support. 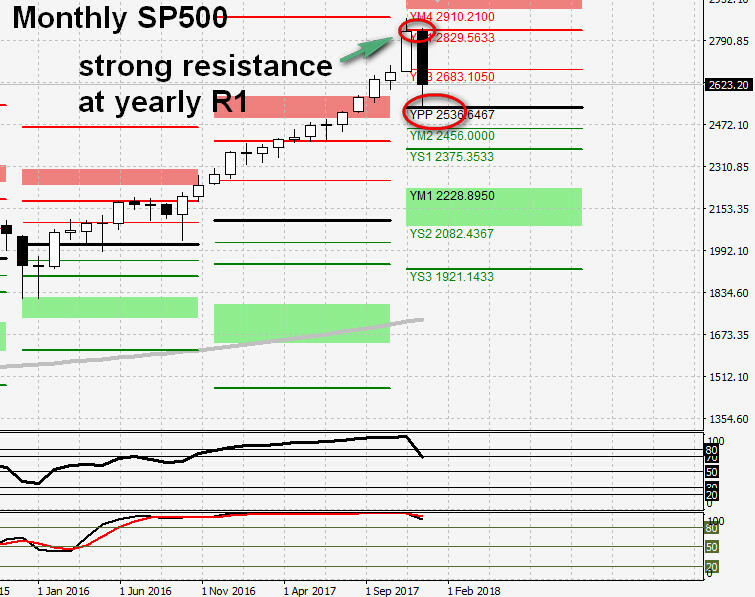 There was also a resistance at yearly R1. How to use yearly Pivots in your trading? When there is a rapid move like the one on SP500 then I go to higher time frames and Pivots to check where important support and resistance are. In the normal trading condition, it is ok to check it from time to time. I usually check the situation on monthly and yearly Pivots in the weekend when I’m preparing for next trading week. During a week I use lower Pivots and my Fibonacci tools to enter a trade, but I’m aware of these important levels from yearly Pivots. The examples above showed you that this information can be very important. Does yearly pivot work for most currency pairs? e.g. The CAD-JPY recently plunged to 87.25, crashing through the Yearly pivot of 88.25 (rather than bouncing off the yearly pivot). Hi Jack. Yes, it does work for any instrument, including currency pairs. In case of CADJPY - it did crash throug pivot line and it did not worked as support. That is an information that we may see a continuation of move down. Check all yen pairs and you will see that yen is getting stronger so we see situation like this on CADJPY. You can watch this video from Mark about yen pairs: https://www.youtube.com/watch?v=JBS0tUHxHjU&feature=youtu.be" rel="nofollow">https://www.youtube.com/watch?v=JBS0tUHxHjU&feature=youtu.be. 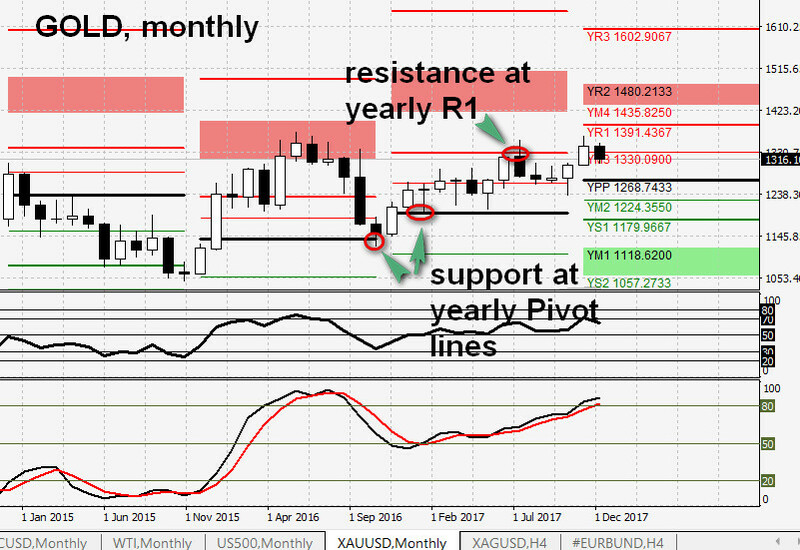 We have to remember that Pivot gives us an information about potential support and resistance lines. I prefer to move to lower time frame. Lets say that price is getting closer to pivot line and I expect support here. I move to lower time frame and wait for signal to go long. If there is no confirmation that this level is working then I'm out. Thank you Simon for your reply. From your experience, may I know whether the price is likely to approach the Yearly Pivot (the central PP) for most currency pairs within the given year? e.g. the Yearly Pivot for EUR-JPY (for 2018) is 128.50. So can we expect the price to reach this level in 2018? If so, can we say that this will apply for all other currency pairs as well? Thank you. depends from the trend. I put yearly pivot on chart. When price is getting near to that line I know it may act as support / resistance. That's it, but I'm not able to predict if it will touch it or not. Ok. Thank you. So the conclusion is that price may not always go near the Yearly Pivot in any given year. Exactly. If you see that price is going in the direction of yearly pivot you may expect that there may be some reaction from the price (bounce or not). I switch to lower time frame to take a trade.